What are you doing to “cause” your business to be successful? In my last blog, I addressed the idea that everyone living is connected to everything else. All our words, emotions, actions and beliefs affect others and the universe around us, regardless of whether people are near or far away. This is the concept of Oneness, upon which Universal Laws are based. Universal Laws influence our everyday lives, and are always at work, whether or not we can see or feel them, and whether we believe in them or not. Although there are many Universal Laws, I have selected ten of them that when adhered to, can help you tap into far greater potential for yourself and your business. This law states that nothing happens by chance, meaning that it is up to us to take responsibility for the role we play in everything that happens in our lives. Every action sets into motion a reaction or consequence. 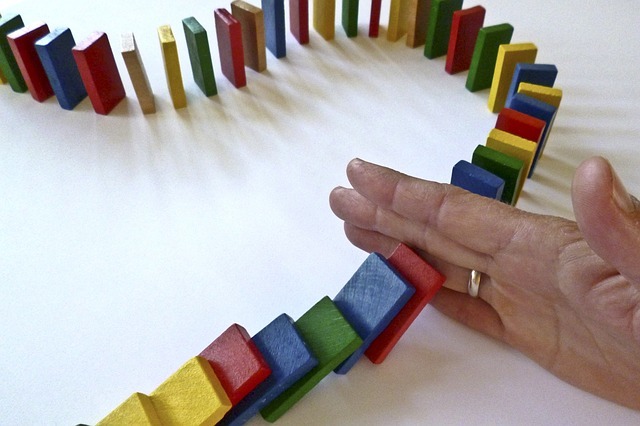 Each action might seem small or inconsequential but the ramifications can be far reaching, such as when a single domino gently falls onto another causing a massive chain reaction, or something is posted on the internet that goes viral. Most of the time we will never know the full impact we have on the world because our perspective is so limited. We can only see as far as the next horizon. But what if you knew at a core level that you had the power to set into motion a positive chain of events that helped the world in countless unknown ways? To help you become more aware, think of three things you do to help your business grow, even though you are not seeing an immediate result? Write these on a piece of paper. As you look through these lists what is easy for you to do and it’s already part of your business strategy? What do you find difficult, uncomfortable, you forget or avoid altogether? Do you really know why you haven’t implemented some of these actions (causes)? What limiting beliefs or emotional blockages do you have that need to be reprogrammed or released? Starting today write down three additional actions you are willing to commit to implementing in your business on a consistent basis. Do these actions remembering the power of the Law of Cause and Effect and make it a point to work with this power and not against it. Amazing results come from taking consistent actions and believing and expecting the outcome.